I’d like to show you how to make an Electricity Monitor for your home that utilises some of the key capabilities of the Arduino Yun or Particle Photon that make them a great choice for Cloud Enabled sensor projects such as this. A 5V Power Supply for the Yun (I used a Smart Phone Charger). The circuit is very simple. 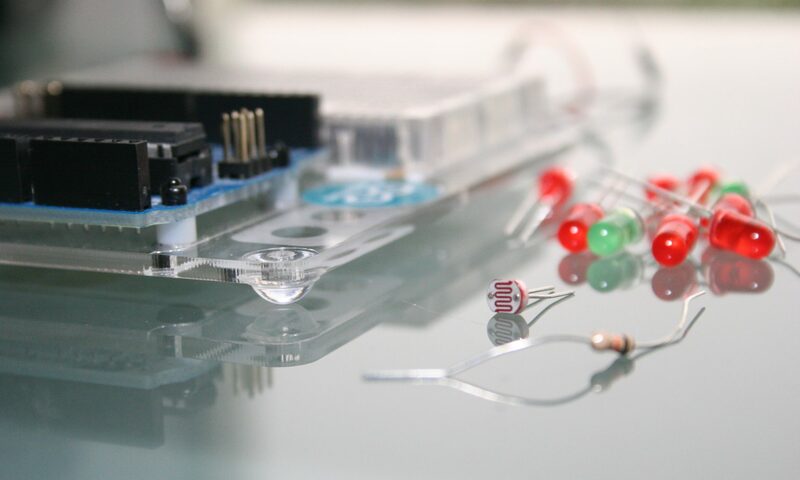 It consists of a Voltage Divider to bias the ADC of the Arduino to a DC Voltage and Voltage Output Current Transformer to add an AC Voltage proportional to the AC Current flowing in the Cable. The Capacitor forms a Low Pass filter with the resistors to remove noise. Lots more details are available at the Open Energy Monitor Project. Build the Circuit as shown here. If you haven’t previously configured your Yun or you’ve Reset its configuration. When the Yun is unconfigured it presents itself as a Wifi Access Point (AP). You connect to that AP from a Wifi Enabled device (e.g. Laptop or Phone) and configure it from it’s default IP address (http://192.168.1.240). Temboo gives us a simple way to access Google APIs. It even gives you the code you need for Arduino (or your fav. programming language for non-Arduino use). The Current Transformer produces a current proportional to the current flowing though it’s magnetic circuit. The proportion of the current in the cable that you get in the transformer is equal to the turns ratio. The SCT013-030 includes a 62 Ohm resistor in parallel with the transformer, making it a Voltage Output type. Make sure the Current Transformer is only around the Live or Neutral NOT BOTH. If it’s around both the magnetic flux in both the Live an Neutral will cancel to yield zero current in the Transformer. I installed the Current Probe in the Main Circuit Breaker of the House as shown. Obviously make sure to replace the Housing. You should NOT leave Electrical cables exposed. It’s not safe. WARNING: Please be Sensible about this. This exposes LIVE Electrical cables that puts you at risk of DEATH by Electrocution. Please proceed at your OWN RISK and if in any doubt consult a registered Electrical Contractor to install the Current Transformer for you. Calculate the RMS value from the MS value by square-rooting it. Multiply by the RMS Voltage (230V in Ireland / UK ; 110V in the USA). Scale to allow for the Current transformer gain and ADC. The Digital Filter Calculation probably deserves a special mention. You don’t need to understand it to do the project but you might find it interesting. u0 = 0.2929*(r0-r2) + 1.411*u1 -0.4142*u2;It is an IIR filter because it operates on input values (past and present) and its own output values (past and present). The Response of the BPF is shown above. A similar technique is used to filter the Current Readings to yield the Mean-Square Current value. AMS = 0.99*AMS +0.01*v*v;This is simply a low pass filter to form a long term average of its input (v^2). See the Console Window Output as shown in the Picture. The Arduino Code Outputs the RMS Power to the Console every 5 seconds. The Console is located in the Arduino IDE as though you’re opening a Serial Monitor Window. But when you have an Arduino Yun connected over IP by Tools -> Port this opens the Console instead. You can access the Console output from your Smart Phone. I use JuiceSSH for Android. Now your Power Readings will appear on the JuiceSSH Console every 5 seconds. The Google Docs Spreadsheet is written Once Per Hour. Because the Power is averaged over an Hour the Data in the Spreadsheet will be in Watt Hours. Also, don’t forget that the Spreadsheet Columns need names in the first row to avoid errors. See the Picture from Temboo previously. Make sure the Monitor reads close to Zero when the Transformer is not connected to the mains cable. Mine read 16Watts. This converts back to 69mA in the mains cable (16W/230V). Therefore the transformer current is 69mA/1800 = 38uA , and the Transformer output Voltage is 38uA * 62 Ohms = 2.4mV . This is equivalent to 1/2 LSB of the ADC which is an excellent result; well within the expected accuracy. Calibrate the Monitor by running it for a day and comparing with the energy consumption recorded on your home’s Electricity meter. Multiply the Prms calculation by this factor so they agree. My system accuracy was -6%. Which is excellent. Nevertheless I add a 1.06 CAL factor to correct for this. You can find the code for this project over on Github.